Gloria started working part-time for the AAVSO in 1999 while attending school part-time at Bunker Hill Community College in Charlestown. Her main responsibility at the office is to enter the monthly observation reports into the database. 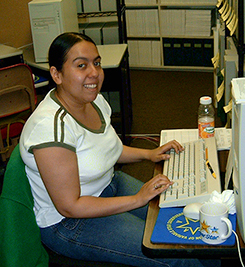 Gloria enjoys working with these paper reports because she likes working with numbers and she is a fast typist. She also helps the staff with mailings if she is in the office and is needed. She is currently working part-time at the AAVSO, averaging about three days a week, but might like to work full-time for a while before continuing her schooling. Gloria graduated from Bunker Hill Community College in 2005 and now plans to attend either Fisher College or Northeastern University to earn a Bachelor of Arts in Management. Previously unfamiliar with astronomy, Gloria was inspired by her work at the AAVSO to take an astronomy class at school. She did well in the course and still remembers the view of the moon through a telescope. She specifically remembers being amazed at the fine details and colors that she was able to see. When not in the office, or at school, Gloria's favorite thing to do is to spend time with her girls Karina and Nayely, and her son Jacob. They all live together with her husband Daniel and close family in Cambridge. Gloria sometimes travels with her husband to Honduras, his native country, where she discovered she likes the warm weather and the spicy food. She has also traveled to Guatemala, to visit her mother's relatives and enjoyed her time there. She likes living in Boston and really likes that she is only a 15 minute walk to the Galleria mall downtown where she loves to go shopping!